Sidney Nolan’s work brought Australian myths, legends, personalities and locations to life. Yet despite this creative loyalty to his homeland, he is one of our most famous exports, having had a spectacular international career largely based in the UK. In 1946 Nolan began a series of iconic paintings which became his motif - the bush-ranger Ned Kelly. The image was a recurring theme throughout his distinguished career, becoming such a part of Australian culture that the Kelly head was a major element of the spectacular Sydney 2000 Olympics opening. 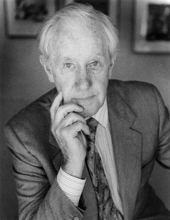 Born in Melbourne on 22 April 1917, Nolan was not only a painter but a story-teller, poet, designer of sets for ballet and opera, and illustrator of books. Early works included legends such as Eliza Fraser, Burke & Wills, and a famous painting of an Australian Rules footballer, believed to have been based on the late football and cricketing great, Keith Miller. Nolan also captured the red rawness of Central Australia and constantly expressed himself in many revealing self-portraits. From 1950, he lived the life of an ex-pat, dying in London on 28 November 1992, aged 75. The underlying tension is evident in Nolan’s last self-portrait, Myself, portraying him trapped behind a shadow of the image that made him famous – the Kelly head.